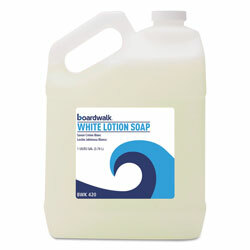 1 Gallon Bottled Soap from Boardwalk! 565 In Stock today. For what it costs, it is a good product. It does the job, although some may not like the scent (cross between almond and coconut). It is perfect for high traffic public restrooms. This hand soap does the job but dont buy it if your looking for a higher quality hand soap. I use it in Schools & it works perfectly!